To prepare for the Milo Marathon held last September, my husband and I decided to check in near the venue as we no longer live in the city. Traveling from home on the day of the race can be inconvenient for us since it would be at least 45-minute commute. It would require us to wake up earlier and would probably make us feel tired even before the race started. Additionally, we also aim for staycations now as we are on traveling hiatus for the next couple of years or so. So staying in a hotel, or at least a budget inn, for this event is a great idea. We chose Urban Inn, located across St. Clements Church in La Paz, as it is just walking distance from the starting line which is the West Visayas State University and finish line at Iloilo Sports Complex. We didn't place any reservation as the husband is confident that there will be room for us since it is not peak season but I was somehow doubtful thinking that other race participants will be checking in too. Luckily, there is one room left when we inquired - deluxe room but twin bed. Good thing, the twin bed can be converted into queen so we went for it. And even if it wasn't convertible, we will still probably stay since the husband is insisting for a place near the venue and besides, we are cuddly sleepers so space is definitely not an issue. Urban Inn offers various room types depending on your needs and preferences. 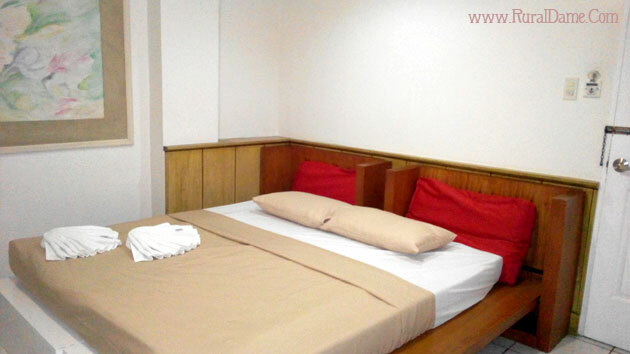 Aside from deluxe room that we got, there are also fan rooms and dorm type rooms ideal for backpackers or group travelers. Since I only had access to deluxe room, that is what I will be describing in this review. The room is big, with hot and cold shower, cable tv, and closet. The bed, which is actually two twin beds converted into one, is okay although I think it is somehow uneven. Maybe because of the comforter they placed on top of the joined bed. The room comes with two pillows which are a bit thin for my liking. Even the husband who prefers thin ones is not quite satisfied with the pillow. The toilet/bath is a bit narrow but it's okay. It is clean, the hot and cold shower is working great and there is a provision of toilet paper, soap and shampoo with conditioner. When considering this inn, make sure to manage your expectations when it comes to the view you will be seeing when you look out of the window. First, the window - at least the room we got - has very small window and outside of it are pipes, electric wires and other nuisance of the hotel. When you look out of it, there is no breathtaking view but just the La Paz Market teeming with vendors and customers alike. The inn offers free wi-fi connection but can only be accessed in the front desk. Our room is in third floor so it is impossible to use the internet while inside our room. The inn also has a cafeteria in the second floor. One downside of this inn, however, is the lack of elevator. But then, you can ask assistance from the staff to help you with your luggage should you need one. Staff here are friendly and helpful. There is nothing much to say about them anymore. Urban Inn is a great place for anyone, be it a budget traveler or families wanting to spend a night or two in the city. It is near churches, schools, market and just a few minutes ride from the downtown area. For Php 1150 per night with free breakfast for two (deluxe room), it is definitely worth it. Luna St. cor. Arroyo Magdalo St.